Chromecast is more than just a hit at the DT offices; it appears to be a legitimate sell-out phenomenon across the country. On Sunday, I checked out my local Best Buy, surprised to find, and then be told that the Chromecast had already sold out of the 10 units they received … in Ft. Gratiot, Michigan. Employees told me that it sold out within an hour of arriving on Friday. I had already heard it sold out on Amazon, Google Play, and BestBuy.com, but selling out online can happen easily. Google can easily sell out online by constraining supply. Selling out at retail is more impressive. After checking with other Best Buy stores and representatives from BestBuy.com, I discovered that Chromecast had indeed been stocked and completely sold out of almost every, if not every, Best Buy in the country. There are none in Michigan, none in New York, none in Portland; it doesn’t appear to be in stock anywhere. Representatives from BestBuy.com called me foolish for even checking stores. They told me that it’s a complete nationwide sellout. One store in my state showed a “Available in-store” marker on the Best Buy site, but it was a fluke. Upon calling and asking that store about Chromecast, the employee laughed and said no, it’s only showing up as in stock because they lost one Chromecast and cannot account for it. I wasn’t the first person who had called. It looks like Google’s new dongle is so popular that people may be stealing or hiding it. We often write about products that seem overhyped, and Chromecast may be one of them, but it appears that there is some actual grassroots demand for it. Doing some napkin math, if every one of the 1056 current Best Buy stores stocked and sold out of 10 Chromecasts this weekend (some likely had many more), then the device has sold through more than 10,560 units on the ground almost instantly. Granted, that’s still not a lot, but to attract so many people all across the country to move so fast is impressive. The number must be much higher factoring in the sellouts on Google Play, Best Buy online, and Amazon. It looks like people may agree that $35 for a dongle that streams Web pages, YouTube, and Netflix (more services coming) from your tablet/phone/PC to your TV is worth it. Our own Andrew Couts didn’t want one, but ended up buying it anyway. You can read his resolution not to buy it here. So what’s going on? 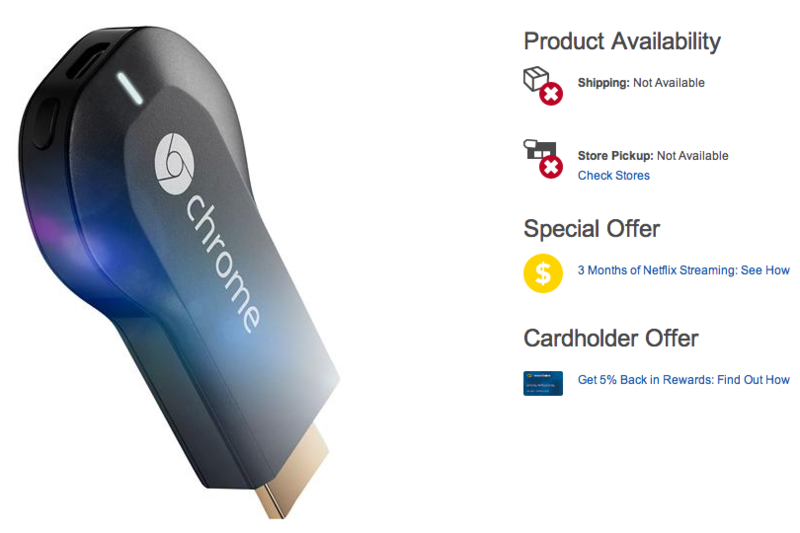 Are we all insane, or is Chromecast a legitimate new product that’s going to stick around?